Why is transforming furniture so alluring? Does it appeal to our sense that innovation is progress, the fact that fewer materials for more uses is sustainable or simply a return to the childhood love of things that we can actively change and shape as we wish? Whatever the reason, these designs range from humorous and impractical to jaw-droppingly cool. Be sure to scroll all the way down: the best (pictured briefly above) has been saved for last and check here for more unusual urban furniture. 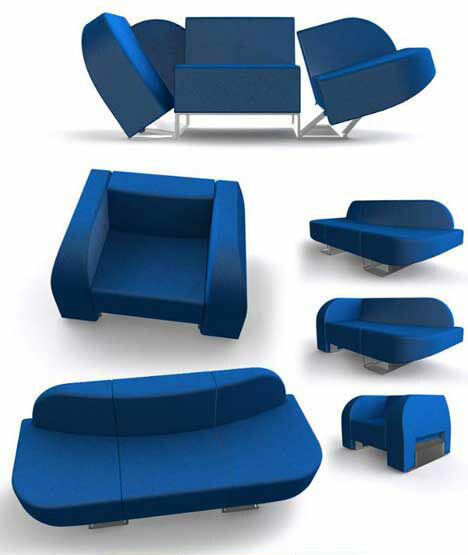 This comfy number is not one nor two but three pieces of furniture in one: a sofa, lounger and a chair. A good deal of transforming furniture looks or feels better in one configuration or another, but this three-in-one by Roel Verhagen-Kaptein is appealing in each of its transformations. Normally we think of convertible furniture as transforming from one useful thing into something else with a practical function. These simply elegant folding chairs by Studio Dror collapse into something you might actually want to use simply for wall decoration: a simpler refined furniture solution than sticking cheap folding chairs back into the closet. Next time you go on a picnic with some friends you may want to grab a second basket, the so-called Mealbox by Igland Design. Fourteen puzzle pieces slip out of this simple container and assemble into a table and chairs that seat six – a humorous variation on fast food. Compact, clever and portable, the Fence Chair by Alain Berteau is a simple blend of traditional picket fence vernacular and sustainable modularity. 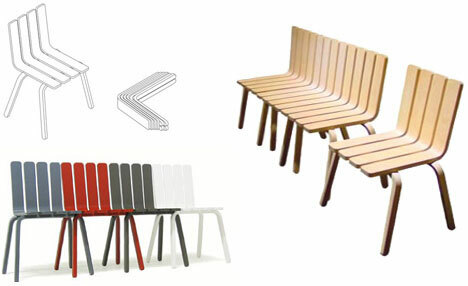 The repeated use of a single simple form allows for compact shipping and the seats can be split or joined as needed. A storable box or subtle side table by all appearances, this articulated shelving system by Bertrand Pinceman folds out into a rather nice bookcase. It is designed to work both on its side and upright. Marta Antoszkeiwicz‘s design is not like most transforming furniture that relies on clever bends, twists and hidden tricks to work. This simple table and chairs set relies only on sliding pieces under and out from under one another. The result, though, is impressive: chairs that go well with the table in either configuration and don’t look like extra elements. Similar in principle to a Murphy bed (which folds down from the wall when needed) this cabinet dining room set has everything one needs to sit down to a comfortable meal and then slides back into place. Neat as this complete furniture solution sounds, though, it isn’t clear how much space is needed behind-the-scenes to make it work. 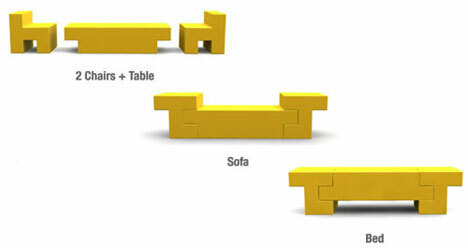 Yellow might not be the best color, but you have to appreciate this simply brilliant Tetris-based Chairs + Table design. Aside from the sofa, bed, and chairs-and-tables configuration these also pack up nicely to be stored. The material is designed to be soft enough to be comfortable but resilient enough to work as an eating or work surface. 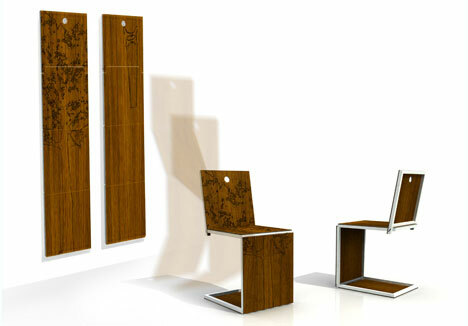 Also, one could imagine that, with sufficient pieces, other creative furniture constructions would be possible. 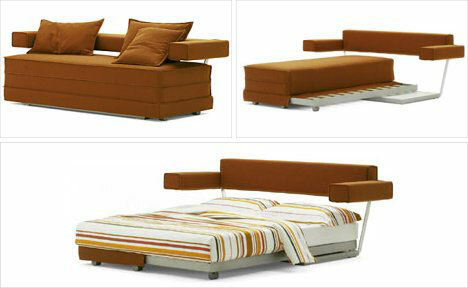 We’re all familiar with beds that fold out from sofas, but few do so as easily and elegantly as this one by Flou. In Modernist tradition, the form of the bed is also partly visible in the form of the couch with each fold-out layer articulated individually. Now this one is particularly strange: a stove and kitchen workspace that doubles as a comfortable chair? An odd combination to be sure, but it is a step in an interesting direction. This kind of out-of-the-box thinking could result in furniture that not only serves a similar function to its counterpart but that would have different purposes in various rooms around a house. Would you believe that everything shown in the above image can be fit into a box that is less than 3 feet by 4 feet? 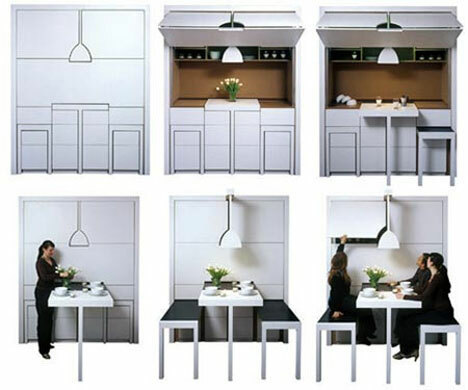 The creative furniture within can be carried, unpacked and rapidly assembled by just two people. It probably goes without saying but: the box itself is also reused in the final results. Check out the video below to see the boxed room in action and go here to see more awesome urban furniture!